The Bowie knife is named after James Bowie, although the design was likely around well before the infamous Sandbar Fight of 1827. NEW ORLEANS – Today, archeologists with the University of Louisiana announced they’ve recovered the knife wielded by James Bowie during the infamous 1827 Sandbar Fight. The bloody encounter, which took place on the banks of the Mississippi River near Vidalia, cemented said knife’s design into what is now known as the Bowie knife. Researchers have attempted to locate the knife Bowie used ever since. As surprising as this discovery is, it’s nothing to compared to the shocking truth hidden beneath nearly 200 years of history. Wood immediately contacted BLADE for confirmation following the discovery before going public with the find. Other BLADE staffers echoed Shackleford’s sentiments. “This is, hands down, the most important piece of knife history to come around in generations. There’s no going back after this. 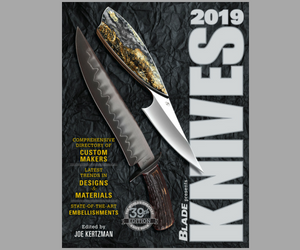 The world of knives will never be the same,” said Ben Sobieck, BLADE online editor. As it turns out, the knife James Bowie used during the brawl isn’t actually the Bowie knife people know today (example above). Because the original knife was never photographed, it could only be described in written reports. This may have led to some confusion as word spread. BLADE is the first and only outlet authorized to share the photo of the original Bowie knife. Wood snapped the picture before recovering the artifact. “This calls into question the entire Sandbar Fight. What really happened on the banks of the Mississippi River all those years ago?” Sobieck said. “Was there really a brawl? Or did the aggrieved parties resolve their disputes through non-violent means? The evidence certainly points that way. “I can’t come to any other conclusion,” Wood said. James Bowie’s “knife” was, in fact, a can opener. “One more note I’d like to add is that it’s April 1, which is April Fools’ Day, and that I feel that the BLADE staff did a great job with this year’s prank,” Shackleford said. “Definitely. And now I’m hungry for some pie. Pumpkin, apple, strawberry, it doesn’t really matter. I’ll put a pot on, too,” Sobieck said. Previous articleIs The Scandi The Best Grind For Bushcraft Knives?